High shaped back waistband with belt loops and D ring attachments. One right hip zip pocket. 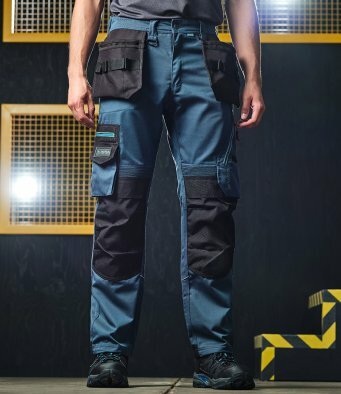 Two multi-function tool and mobile phone pockets on legs with reflective piping. Elasticated panels above knees for ease of movement. Drawcord hem with reinforced hem overlay. Reflective piping on rear of legs. Branding on left waistband, rear belt loop, rear and lower leg pockets.